Expand your field! Reduce your f/value, speeding up the collection of photons! And do it with pin-point stars all the way to the corners of your full frame 35 mm sensor! The new Quad TCC (four element Telecompressor Corrector) when coupled with the Astro-Physics 130 Starfire GTX is an imaging machine at f/4.5 and a focal length of 585 mm. It covers an approximate 3.5 x 2.4 degree field when using a full frame 35 mm sensor and an amazing 3.5 x 3.5 degrees when using a 16803 sensor! There will be no need to mosaic your images, but when you do…Wow! Four carefully matched glass elements are carefully figured and then coated with the very latest multi-coatings to produce this optical wonder. All mechanical parts, including the covers, are CNC machined and black anodized with a lustrous finish. 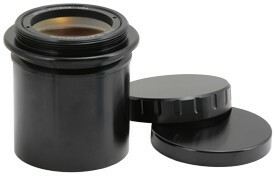 The Quad TCC takes advantage of our new 3.5” focuser to provide coverage of a full frame sensor. 130 Starfire EDFGT owners can celebrate with the knowledge that their 2.7” focusers can be upgraded with the 3.5” focuser and then also use the Quad TCC. We believe in spreading the imaging fun around. The Quad TCC will also work with Telescope Engineering Company’s APO 140ED f/7 scope, making it a 700 mm, f/5 flat-field imaging scope! No fancy modifications are needed…simply attach our Drawtube Endcap (S35RFAA) to TEC’s Starlight Instrument focuser, then slip in the Quad TCC and you’re ready to go. The TEC 160 and TEC 180 scopes with the Starlight Instruments 3.5” focuser can also employ the Quad TCC (a different backfocus spacer will need to be used). The fun just goes on! Scope Part Code Backfocus Spacer Spacing with Bf. S. Spacing without Bf. S.